This fic isn't by me, but it was written as a gift for my birthday. It's good fun, and since there's not all that much QL fic happening, I thought you'd enjoy taking a look. It's a crossover between QL and Supernatural, in 4 parts - at the end of each part is the link to the next one. Sam Leaps into the Winchester boys' dad during a hunt for a supernatural critter and has to deal not only with that problem, but with two kids who come after him with guns and holy water. She'd appreciate your comments, I'm sure. If you're not a member of Live Journal, just click the Comments link (I think she's got it as "I forgot to tell you something") and when the comment window pops up, select Anonymous (but sign your name). However...I find the statement that there isn't much QL fanfiction being written as rather strange. True, it's not like there are 100's of stories being written and posted every single day, but there are stories being written, many of which I have enjoyed immensely. 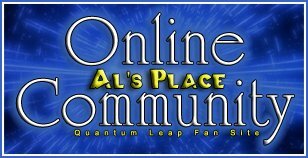 The Virtual Seasons are still being produced (as well as Quantum Retribution.) There are stories at fanfiction.net and there are other stories posted at other sites as well. Overall, I'd say that the world of QL fanfic is live and well. Give the story a try - all you'd really need to know in order to read it is: There are two young boys, Sam and Dean. Their mom died in a fire when Dean was 4 and Sam was 6 months old. When their dad found out that the fire had supernatural origins, he became a hunter of supernatural things (with the goal of finding the thing that killed his wife). He began training the boys at an early age to be aware of the supernatural, and how to protect themselves from it. Personnally, I think the number of stories we get in QL is pretty good considering the show has been off the air for 14 years. I'd imagine in the the day, all things being equal (i.e. if the internet environment was exactly the same) we would have seen that many per day. I'll give the story a try soon. I have a few more in the queue at the moment.